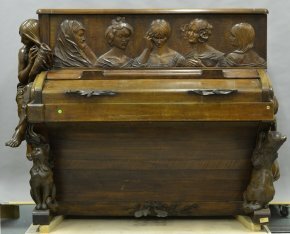 1/02/12 - Restitution - Paris, Musée des Arts Décoratifs - The Musée des Arts Décoratifs can finally exhibit a piano sculpted by Rupert Carabin in 1900 (ill. 1 and 2), for the first time today although it had been originally donated in 1938. A superb example of Art Nouveau furniture, this instrument was produced for Alexandre Honoré Ernest Coquelin, known as Coquelin Cadet, a famous actor of the Comédie Française and exhibited by the Herz firm, a piano maker, at the Exposition Universelle the same year. As the actor could not afford to pay for the work, the piano was finally sold to Germaine Dulac, an equally well known film director. Subsequently, her daughter donated it in 1938 to the Musée des Arts Décoratifs which placed it on deposit at the Ecole Boulle in Paris where it disappeared during the Occupation. It was only in 1974 (!) that it was officially declared as lost, showing just how deficient inventory and verification operations were during that period (and how deposits should never be made outside of museums). The piano resurfaced in 1981 at Sotheby’s New York. Having discovered its origins in the course of its research, the auction house immediately contacted the Musée des Arts Décoratifs. However, long negociations were needed before the last owner, who expressed his good faith in a press release, accepted to graciously return the instrument to the museum. 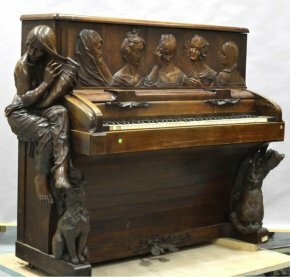 All is well which ends well for this masterpiece, a typical example of the sculptor’s art, and an eminently rare object since there are only twenty or so known furniture pieces by Carabin. It took thirty years to notice its disappearance, another thirty to recover it after it was found. Fortunately, museums have time in their favor.